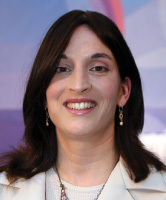 While Rivka Ravitz was earning her undergraduate degree in computer science, she had a 'few other things' in her life to manage: giving birth, a household of nine children, and heading the office of the Speaker of the Knesset. Now, she's on the track to earning her MBA. It's been a handful, she admits, but it's also been replete with moments of remarkable insights and self-growth, thanks to the Open University. Rivka Ravitz is no ordinary woman, whether you are part of the secular world, or as Rivka is, part of the ultra-Orthodox world. She has been working at the Knesset since 1997, where she began as Ruby Rivlin's parliamentary assistant. Now, in his position as Speaker of the Knesset, she is the Director of his exceedingly busy office, which receives guests from around the world, monitors the passage of laws, handles thousands of requests and inquiries, and sets the agenda for meetings with officials and the general public. After a few years of working as a parliamentary assistant, Rivka decided that she wanted to advance in her career, and the only way to do so was by earning a Bachelor's degree. She had been educated in the Beit Yaakov network of ultra-Orthodox schools and, as a result, had not completed her matriculation exams. "I began looking into different programs, and also spoke with some of the other assistants in the Knesset, who overwhelmingly recommended the Open University." Her original intention was to major in mathematics -- "I always loved math, even as a little girl" -- but based upon the recommendation of an Open University advisor, she opted for management and computer science. Did the studies help her in her day-to-day routines? Absolutely, according to Rivka. "I didn't think they would, but they did. Every course helped me in something, whether it was statistics or labor laws. Every day I learned something new and was able to apply it somewhere in my life." Rivka's average work day begins at 8:00 AM and can extend well into the night. But, during her undergraduate studies, her actual work day began at 3:00 AM. "That was the only time I had to study" she explains. "I would try to go to bed early, say by 10:00 PM, and then wake up at 3:00 or 4:00 in the morning and study straight through until 7:00 AM" when the children had to be woken for school, sandwiches made and book bags packed. During the three years of her undergraduate program, she also gave birth to three children, and never went to the hospital 'empty handed' so to speak. Each time, she would pack up clothes to take the baby home in, alongside her books and notes for studying. If you ask Rivka what was the secret to her unique management style, she would probably answer three things: "a helpful mother, a supportive husband and the Open University." Today, Rivka is studying for a Master's degree in Business Administration and implementation of computer systems at the Open University. Always multi-tasking, she is also teaching logic in computer science at a religious girls college in Jerusalem, continues to manage Ruby Rivlin's office ("he takes a real interest in my studies") and just gave birth to her tenth child.